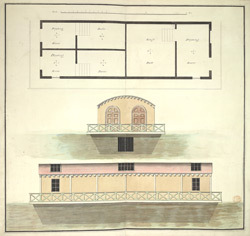 Plan and side elevations of the King's Floating Baths at Weymouth, showing how the craft would lie in the water. George III made 14 visits to Weymouth from 1789 to 1805 during the summer or autumn season. This made Weymouth was one of the most fashionable Georgian sea bathing resorts. George III , Queen Charlotte and several of their children first came here in 1789. The King bathed in the sea water and as was the custom, used a bathing machine. This was a wooden cart pulled out to sea by a horse, which often had a hood to shield the bather's privacy. However this design for King's floating baths was on a grander scale. It had a large dressing room and spacious separate bath for the King with two smaller baths and dressing rooms next door.